Okay. So talk is Work Model’s Future. And what I wanna talk about is just this notion of work and with the way we think about things and what that means for us in the future. Maybe not. So work versus jobs. I think it’s important to think about what that means, what that’s like. 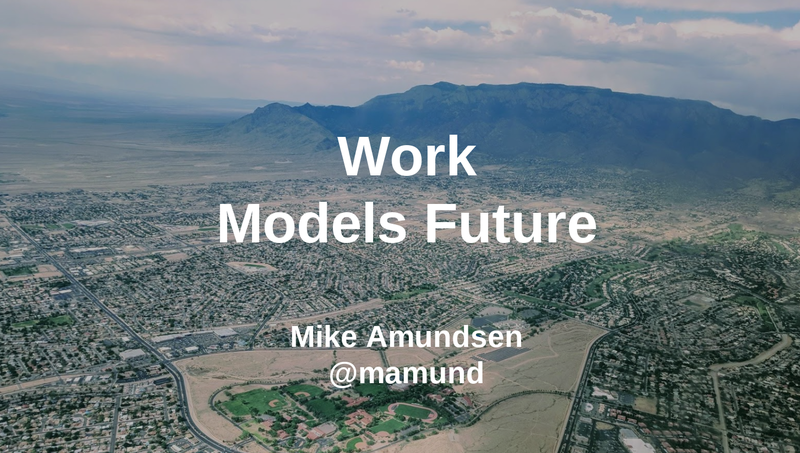 Also, I have this notion, I do a lot of things about patterns and models and I recognize some models about the way automation has happened over the centuries. And I think being aware of that, or at least having something like that in our heads, gives us some power to think about what we’re experiencing now, and how we can use that information to alter our experiences in the future, what we can expect, what we can anticipate, what we can recognize, what we can help others expect and recognize. And also the notion about the idea of making or being the future. And for me, they’re the same thing, and I think that also can be valuable. As a background to this, I’m going to mention Karel Capek. I don’t know if anyone has heard of this author. Karel Capek wrote a play called "Rossum’s Universal Robots." It’s basically the Terminator’s story written in 1920.This Czech author, who writes about this person who has created a "roboti," which is the Czech word, and they end up doing all the work, and eventually eliminate humanity. And this is 1920. So we’re coming up on just 100 years since this play. So I’ve got two years to milk the story. Karel Capek is actually an amazing thinker. In Europe, at the time, when socialism and all these other things are starting to come into play and people were rethinking economy, rethinking how we define society, what the role of the individual and the work in the organization is, and what we centralize and decentralize, all the things we’re doing now. So I think he’s got some really interesting ideas. The word that he used for his creatures was "roboti." And in Czech this really has this relationship with slaves and forced labor, and also a connection to orphans. So this word was really powerful for him to use this word about these creatures that were created to do all the work of humans. So it’s an incredibly powerful word that we now use as sort of this animatronic sort of thing, robot, robot, so on and so forth. So I think it’s interesting to kind of go back and recall what kind of messaging was in this word 100 years ago to help us a little bit to deal with things today. All right. So with that as a background, I wanna talk about this idea of work. So here’s a nice quote from the play, "Terrible things can happen that may not be avoided." In 1995, Jeremy Rifkin writes this, I think, really great book that he calls "The End of Work." This is during the Clinton era in the United States when we’re getting some major economic disruptions. We’ve just been through the '70s economic disruptions where we had lots of economic problems and our president at the time actually sat down against everyone’s advice and talked to the nation and said, "You’re gonna need to rethink your priorities about your consumerism, and then we’re gonna start to need to connect with each other and pay attention to each other." And when Carter said that, an actor in California said, "I can be president by saying a message that you can ignore all of the doom and we’ll be great again, a shining city on a hill." So Reagan comes into power after this. So this is after…we’ve got to gone through that, now Clinton happens to be the last president in the United States that, when dealing with an economic disruption, talks about teaching people new jobs. We used to always have these jobs programs. We’re gonna have jobs programs. We’re gonna bring the farmers and do the factory work, and the factory workers do the office work. And by the time we get to the '90s there’s not much talk of that left. And this is part of the reason. Because in the background, what’s really happening is jobs are disappearing and not just changing but simply disappearing. So a story that Rifkin gives in the book, and I’m just gonna do it because it’s shorthand, is about farming in the United States. Two hundred years ago, 75% of the economy, 75% of the jobs were related directly to farming, 75%. Now, there was a smaller population 200 years ago. But think of the notion of how important farming was as a way of life. By the time we get 50 years later, that’s down to 50%, and yet the population has grown up. So each one of these the population goes up. By 1900, one-third. By 1950, less than 20%. By the year 2000, less than 3% of the jobs are related to farming, yet we end up feeding the nation in the United States. So why is that? All sorts of automations and efficiencies and chemistries, and all sorts of other reasons, not all good but all existing, completely changed the landscape. Those jobs are never going to come back, right? And we’ve gotten used to that idea. Much of the Dust Bowl coincides with the same final destruction of this job community, and we began to think that our future is in the factory and we start to remake things. But those farming jobs are just not coming back. So is that the only time this will ever happen? Is this the only job sector ever that will disappear and never come back? Of course not. So looking at some of the U.S. Bureau of Labor’s statistics over the last century, we see, this is operative, so these are the assembly workers, truck drivers and miners, things like that. And you can see, most of the numbers peak somewhere around the '50s and '60s and start to go down. This pretty much mirrors what we’re experiencing. If you look more closely, there is this tiny little element that actually tends to be steady, and, in fact, it’s not really reflective, but in the last couple of decades this has actually gone up. This heavy dotted line, long-haul tract drivers, going up. Long-haul tract driving is one of the few jobs in United States right now where you don’t have to have a college degree and you can earn a living wage and own a home and put kids through school. It’s not an easy job, but it’s at least one of those jobs. And right now we have over 80,000 open slots for long-haul trucking, just in the U.S. Clerical workers. You see this huge rise, '60s, '70s, and '80s office clerical jobs, as well as, this also includes cashiers and other jobs like that, but then starting in the decline in the '90s and then actually goes down quite a bit more noticeably in the last decade. Again, if you look more closely, if we break them up, with this, cashiers, store cashiers, convenience stores, grocery store cashiers. Now, you can guess where I’m going. What are the two things that have been growing? And? The two things that we’re gonna automate? Driving around the stuff that’s currently being made in other countries that were used to be made here. Right, yeah. I didn’t even go into the manufacturing side. We just skipped over the manufacturing section because we don’t have time, but you’re exactly correct. So there’s that group of people going… By the way, a cashier’s job, half the earnings power of a truck driver,. That means somewhere in the $20 an hour range, which means, in many cities, you can still afford a two-bedroom apartment, but you cannot get ahead. It’s very difficult to do anything like college or anything like that. Not really a sustainable job. I wonder how many people, the wife is a cashier and the husband is a long-haul truck driver. Yes. And to channel, George W. Bush, on stage with a woman who has three or four jobs, explaining how she works hard, and he says, "Uniquely American." Yeah. Congratulations, you’re living the dream. That’s quite right. So Rifkin, basically, the point of this book is, "Look, fewer and fewer workers will be needed." Now, some of that has to do with the fact that we now have "roboti" in other countries. We exported their work. I could do a whole talk of folks coming to [inaudible 00:09:31], why they had to go ahead and put nets on the top of the building to keep their workers from throwing stuff up, but that’s a different talk. Those jobs will go away, too. This is a pattern. A job is not work. This is where I differ from Jeremy. I think Jeremy’s was very viable, but I think it’s important to think of the difference between job and work. Job, at least in the U.S., that is not actually…that’s not been around a long time. The notion that I need a job to sustain my family, that wasn’t happening in the 1800s. Most people lived in their own economy. They created their own small community, their own economy, and dollars and money and paychecks and savings and mortgages were not a part of their life. This is something we’ve invented in the last 150 years or so here. We all need work. We all need that opportunity to contribute and have experience and share, but that doesn’t mean we all need a job. We measure a great deal in the United States about what the jobless rate is. We measure what we wanna control, but jobs aren’t necessarily a good thing. So I wanna talk a little side piece of this to get a little edge on this. We’ll talk a lot about the demand economy. There’s a lot of talk about the demand economy. I tend to think about it a couple of different ways. The most common way that people think about is the on-demand economy. What is the on-demand economy? The on-demand economy is Uber and Lyft, and day labor, and part-time work. When some employer demands, I show up. It’s driven by the demand of the employer or the consumer. The employers or the consumers set the wage, set the hour, set the time, and I simply appear. And we have all sorts of on-demand economy going on today. Most minimum wage workers are in the on-demand economy. Even some salary workers, where they can barely make ends meet, they’re really in the on-demand. If the demand goes away, their job is gone. And the demand can go away for lots of reasons, automation, somebody willing to do it for less, the ability to ship it away, the demand is gone. They cannot earn. That’s different than the in-demand experience. What is in-demand? Gilds, crafts, artists, people who are the ones who set the price. I set the price for my consulting, for my work, for my artistry, for my labor. Etsy is an example of an in-demand economy model. Etsy doesn’t set the price. Uber and Lyft, that’s an on-demand economy. They set the price. As a matter of fact, what’s great about Uber is they actually control the pricing experience for both the driver and the rider, and they take a cut of both. But in-demand economy, and many of us here in this room operate on the in-demand model. What’s a good example of in-demand? I can say no to a job with confidence that I will find another one soon enough that it doesn’t jeopardize my ability to sustain myself and my family. Sometimes we’re surprised. Sometimes we think we’re on the in-demand ladder, but we’re really in the on-demand ladder. Many people in the on-demand ladder think they’re in the in-demand community or aspire to be in the in-demand community. There’s one more that I wanna point out, the no-demand economy. What is the no-demand economy? Rent seekers, property owners, copyright, royalties, patents, apartment dwellers, business owners with lots of on-demand laborers. They don’t have to work. You don’t have to worry about the variabilities from one day to the next. Their children will go to the schools as they wish, they all have a home, they have all these things. Right now that’s what? Five, 3% of U.S. recognize the economy? The 1800s? Think of all those farmers. Aside from the work they had to do, they had the same thing. They had home, they had land, they had property, they had the ability to stay and they could say no to things. And in many ways, when we think about the lives we want, we want the no-demand experience. Yeah? Except they don’t [inaudible 00:14:33], 3% to 5% of the people, but not 3% to 5% of the economy. Oh, exactly. Yeah, that’s good. I conflated there, that’s good. So when we think about the demand economy we think about economic models and we think about things like this. I think it’s important to note, to have this idea that it’s not all the same for everyone. Some people have choices, some don’t. Some aspire, some don’t. Some have worries, some don’t. So really a lot of this has to do with this notion of what do we wanna balance? What do we want to control? What do we want to sustain? The notion of universal income and all these other models have this idea that everyone should have some level of no-demand to sustain them, which gives them freedom to work on the things that are interesting, passionate, profitable, so on and so forth. So they have freedom to say no. All right. So I wanna talk about a little bit more about models. I kinda came up with a short model there, but I wanna talk a little bit more about models. And another great quote from Karel, the rule of the robots, right? So I’m gonna take on a little trip. Let’s go bowling. About 1920, about the same time that Karel Capek was writing "Rossum’s Universal Robots," this is what bowling looked like. Pin boys. And they were boys, almost exclusively, and they would set up the pins and then we would ball. My dad was a pin boy, just to point. I love the story. So you can see, this is how we do pins. By the 1930s or '40s we were annoyed by the lack of accuracy of the pin boys. They didn’t set the pins in the right place. Except for your dad. He was very good at it. I’m sorry. So we come up with a machine, we come up with a tool. Then we’re going to fill this tool where the pins are and we pull a lever and it drops the pins exactly where it needs to go. We have a mechanic that’s assisting the accuracy of a human. This is much better. Still a lot of work, we still got to load them all, [inaudible 00:16:41], pick them up, collect them up, but now we’re very accurate. By the time we get past the '40s into the early '50s a lot of this is automated. All they really need to do is keep collecting up all the pins out of the sides and just throw them in. And then magically they get put in the right place, and at the right time they get lowered, and everything’s fine. So now, I have a human tending the machine that’s doing the work. My job is simply done. When I’m in there [inaudible 00:17:10] put them in, then the magic happens. By the late '50s, of course, we took care of it. In the late '50s we’ve gotten rid of the human. Now we’ve completely automated the process. The pins are all collected, they’re all rounded up, put into the right place, they automatically go down when they’re ready. Now, with lights go on, so on and so forth. So that’s a pattern. And we see that pattern in lots of other places, as well. Stage one is when humans do the work. Well, okay, horses maybe in this case. We have this notion where humans do the work, make the decision, do the labor. Stage two, we get machines that help us increase our accuracy, dependability, speed, so on and so forth. Stage three, machines are actually now more powerful than humans, more accurate, possibly more dependable, maybe even more desirable than employing a human, but we still need humans to tend them, they can’t work on their own. They’re not to be trusted, they don’t make the right decisions, they don’t know how to act, they’re not accurate enough. And then finally, we get to the point where we can say, "We don’t need a human." One, two, three, four, over and over and over and over. I did this quickly but I’m sure I could go back to Mesopotamia, to early days, and find the same things. So I look at this as an S curve, not just as an arc, not as just this sort of a stuff, but an S curve, an S curve that continues, actually. And really placing these elements on the line, humans, augmented, tending, unattended. We go through these over and over again. So where are we on this curve? I took the list of the top level U.S. business curves, agriculture, foraging, fishing, mining, construction, manufacturing, transportation, wholesale and retail. Think of each one of these, where are we on each of those right now? Where are we on that S curve? How far can we automate? This is one of the first things we can start to think about, where we are today, where each one of these industries are today. If I was a businessman in the automation business, I would be starting to map this space out to figure out where my next great opportunity is, right? And one of the businessmen, one of the people they used to map this out carefully were union organizers. Where is the opportunity? Where can I help people organize? Where can I find the changing of this organizational element? Where can I help people to perceive what’s about to happen to their lives, to their ability to be in-demand or on-demand? There’s all sorts of opportunity when we start to think about this pattern. So it’s curves, right? And everyone’s on a different pattern. Everyone’s on a different set. And more importantly, it’s going on all over. I just read this article this week. Amazon is getting rid of the people who decide what to stock, what to put in the retail listing. Algorithms are doing that. And I love this quote, "In the beginning they could be overridden, but now they prove they’re worth and you need to justify why a human needs to interfere." Yes. Actually, I don’t think that’s actually the Visa scope, that’s actually the article. Oh yeah. So it’s not a quote, really, it’s quoted from the article. But of course, this is exactly what goes on all the time. It’s what happened to the pin boys. So this is always what we’re dealing with. There is this pattern. And the magic, the crazy, happens when one curve completes its run and we get sort of comfortable with the idea that we don’t need pin boys and then they wanna change something. So there’s some disruption, there’s some confusion, there’s some upset. Things were going great. "I liked the way the union thing worked, why are they getting rid of unions?" Right? There’s some disruption going on. And that’s the opportunity. That’s opportunity for both positive and negative change. And what I think we’re doing right now is we’re living this disruption. We’re living in this sort of crossing of the curves. By the way, if you’re interested in this idea, there’s a great book, called "Jumping the S Curve" by Nunes and Breene. It’s a businessy thing but I think it gives you a look into the mindset of people who do a lot of this kind of work. We think about what’s the next level, what’s the next opportunity for change, who are the harbingers. It’s kind of goes along with crossing the chasm and some other things, but I found the book interesting. All right, one last thing. So let’s talk about the future. Karel has a great line. This is the intent of the inventor, right, that we’ll all live lives to perfect ourselves. We do whatever we want. So I’ll channel Alan Kay, a quote from Alan Kay, "The best way to predict the future is to invent it." By the way he explained in an interview that he said, "That’s a cautionary note." He said that wasn’t necessarily an optimistic message. He said, "It was meant as a cautionary note." What he means is, what we’re doing now is inventing it. And we can have our hands on the wheel or hands off the wheel. As we invent it. So I wanna talk about a recipe for reinventing or inventing the future. A recipe that I actually learned from a gentleman by the name of Beau Lotto, who’s got a great book, I’ll talk about in a minute, and I feel really excited about this idea because it’s intuitively correct for me. So first, right, we do not see the world. We never see the world. We have a filter that allows us to interpret the signal, right? That’s why this is a duck, that’s why this is a rabbit, so on and so forth. Right? We have filters. That’s what we have, what we have. That’s all we have. Our assumptions are the sum total of those filters. And we keep the filters that seem to sustain us in some way. We keep the filters that keep us from getting eaten by, say, a tiger, keep us from getting fired at work, keep us from losing our partner in an argument, keep our kids from getting run over by traffic. We have all the filters. And those filters are the things that we use about the way the world works. "I’m not gonna do this because that’s gonna be bad." That’s a filter. Filters govern choice. "I’ve done this enough times, and I know that’s how this turns out, I’m gonna turn left." Right? The filters we’ve saved are the choices we make. And that’s good news. Because that means the filters we save are our future. It’s as simple as that. The choices we make, make our future. So you wanna change the future? It’s really easy. That’s how you do it, exactly how you do it. Because the filters we carry are our interpretation of our past. I’m gonna just take a brief moment to, because a couple of other people have shared this, my filters and my past affect my future. And 50 years ago, when I was 9, my mother died unexpectedly, left me with a stepfather incapable of dealing with my internal grief for my external behaviors, would ultimately be going to a boys home. Hours and hours and weeks and weeks and months and months of therapy, over decades. Changing my name in order to start creating a healthy identity, and it’s not my birthday. And even to this day, continuing all of that. What am I doing? All of my therapy, all these other things, I’m re-engineering the past, the meaning of my mother’s death, the importance in relationship of my father’s inability to deal with me, the reason I need to build an identity. This is not changing the past. This is just simply re-imagining, re-engineering, what Laura calls re-meaning. Politicians know exactly what this means, to get us to re-engineer what the past meant, to save certain filters, to apply certain filters on cue. The good news is we have that power, all of this is built in, right? And it’s a continuing journey. Several people have shared parts of their journey this week, and I really appreciate it, and that’s why I did this. I don’t do this to be maudlin or self-centered or to think that my particular story is interesting, but because it’s another example that so many of us are living. And we live it all the time. I re-engineered a lot of my past. And recently, within the last two years, three years, I was suddenly reunited with a sister that I had not seen in half a century. I even found out that she’s been living an hour and half away for 20 years and that we’ve been in the same room, at the same concerts, at the same events over these last 15, 20 years. We never knew it. Now I have so much more to re-engineer. Right? So this ability to do this is really critical. He calls it, "Re-meaning the past." So I love this book. It’s called "Deviate" by Beau Lotto. He’s a neuroscientist. It’s a pop science book. So if you’re a deep scientist this might bug you. But I find it incredibly inspirational and interesting. Basically, I love this quote, "We’re ever growing, ever changing. We are not passive listeners, we are the storyteller." And so much of what so many of us do, storytelling. So this really connects with me. The name of the book is "Deviate." I’ll share the slides in the spreadsheet. So, because it’s my brand I’m gonna do this, okay? What is the API for changing the future? Well, Beau Lotto gives us the first one. Actively seeking contracts is the engine that drives change. Actively stepping outside of the comfort zone, changing our boundaries, actively re-engineering our past. This is a key element for us to change what our future is going to be, active. A couple of other nuggets I’m just gonna throw in here. Right? We know this one. What is this really about? For me, it’s about personal, it’s about things I’m passionate about, it’s about Mary’s list, it’s about things that mean something to me, mean something to each of us. It’s about adopt an agency. It’s about all the things that each one of us have talked about that we’re passionate about. And finally, Jane Goodall, right? Everyone makes a difference. That, to me, is about incremental. Right? Just making a Facebook page and listing, "Can you help me with these things?" And suddenly, now, look what’s happening, right? I don’t have a plan to save the world. I can just change one little part of it today, right? So I think that is really what that’s about, right? Active personal and incremental over and over and over and over again. We can do that. That’s easy. It’s challenging, but it’s not complicated. It does take a lot of courage, though. So I’ve got some challenge questions at the end that we can talk about. Going back to the three things. What would the world look like if you had lots of work to do but no jobs? Can we do that? What would that change? What would that force? What would we need to sustain that? How would that work? If we start to think now about what used to happen hundreds of year ago and if we can re-engineer that in some way, maybe that’s possible. How do we deal with the disruption? How do we deal with those moments that we’re comfortable with but we know things are starting to change? How can we help people see them earlier? How can we help people recognize where they are in the curve? What kind of things can we do to make that better? And how can we get people to actively think about why their re-meaning, not if they are, but why they are. Why have we decided to be romantic about certain things in this America’s past? Why have we decided to not talk about certain parts of our history, about communities, and here I hear, we’re on native land, and so on and so forth? Why are we doing those things? And what would it mean if we started to re-engineer that? How can we scale that pattern of active personal and incremental? The work we do creates the models to the future. We do that here. And we do it every day. Being active, being aware, being conscious just gives us more power. So hopefully those are some ideas to think about. Thank you very much for letting me do that. Thanks.